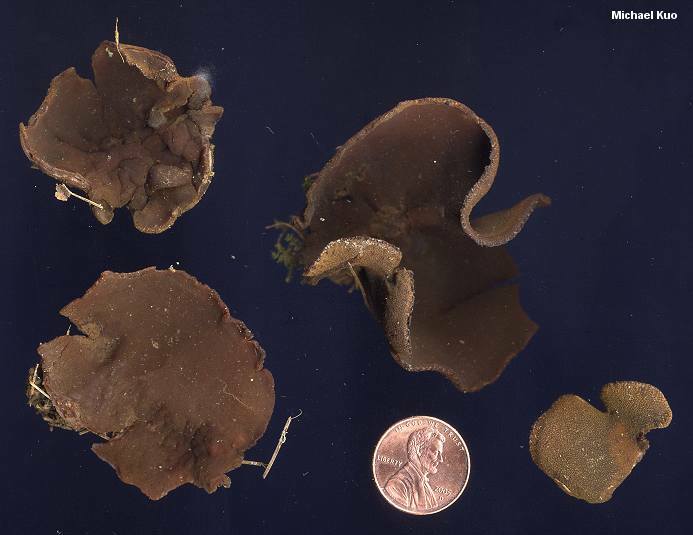 If you have found a large, brown cup fungus while hunting yellow morels, odds are fairly high that it is Peziza badioconfusa--a commonly collected late spring to early summer species. 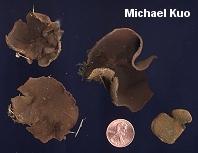 However, plenty of other brown cups appear in morel season--from Disciotis venosa (very closely related to the morels) to cup-like species of Gyromitra (in the same genus as the false morels) to other species of Peziza--and microscopic analysis may be required to separate these mushrooms with certainty. 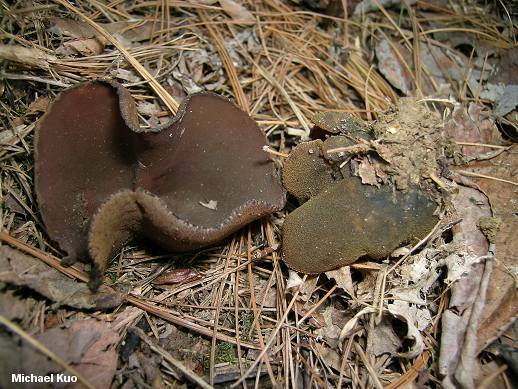 Like other species of Peziza, Peziza badioconfusa has brittle flesh and ascus tips that turn blue in iodine mounts. It has spores that develop a roughened surface of warts and ridges, as well as fairly large "end caps." The similar Peziza badia has spores that lack end caps but feature well developed ornamentation that is nearly reticulate--but Peziza badia appears in late summer and fall, so direct comparison of sporal anatomy is rarely needed; only in far northern regions like Alaska have researchers found the two species growing at the same time. After studying the type collection of Peziza phyllogena, Pfister (1987) concluded it was the same as Peziza badioconfusa. Since phyllogena is the older name, it is probably the proper name for the species. I am using badioconfusa since it is widely recognized. Ecology: Saprobic, growing alone, gregariously, or in small clusters; usually found near (or growing from) rotting wood, in lignin-rich soil; common in white pine forests, but appearing under hardwoods as well; late spring and early summer; widely distributed in North America. Fruiting Body: Cup-shaped when young, often flattening with age and/or becoming irregularly shaped; when clustered often becoming pinched and contorted; 3-15 cm across; upper surface smooth, brown to reddish brown, purplish brown, or olive brown; outer surface roughened or finely mealy to granular with tiny, reddish to orangish fibers, especially toward the margin; stem absent; attached to the substrate at a central location; odor and taste not distinctive; flesh brownish and brittle. Chemical Reactions: KOH negative on all surfaces; Melzer's reagent blackish blue on upper surface of mature specimens. 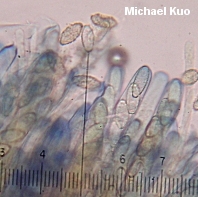 Microscopic Features: Spores 14-21 x 6.5-10.5 µ; at maturity finely roughened-warty; often developing smooth apical caps; fusoid-elliptical when immature, becoming elliptical. Asci eight-spored; with blue tips in Melzer's reagent; up to 285 x 15 µ. Paraphyses 4-5 µ wide; cylindric; with rounded, non-swollen tips. REFERENCES: Korf, 1954. (Saccardo, 1889 [P. phyllogena]; Korf, 1954; Wells & Kempton, 1967; Elliott & Kaufert, 1973; Smith, Smith & Weber, 1981; Pfister, 1987; Phillips, 1991/2005; Lincoff, 1992; Roody, 2003; McNeil, 2006.) Herb. Kuo 05120605, 05060701. Kuo, M. (2007, May). Peziza badioconfusa. Retrieved from the MushroomExpert.Com Web site: http://www.mushroomexpert.com/peziza_badioconfusa.html.